This is a great adventure game in which you will play with Johnny. He is an upgrade maniac and he should be, given the fact that he cannot do much outside them. 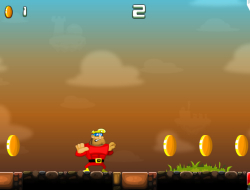 The goal is to collect as many golden coins in each run and constantly upgrading his speed to reach further spots filled with golden coins, his jumping power, which will allow you to jump to some crazy heights and collect even more gold. Also you should increase the time limit of each round and also his energy as there will be enemies that will kill you if you hit them. Johnny Upgrade 0.00 between 0 and 10 based on 0 votes.